View Talay 7. This beachfront condominium is located in the Jomtien area. The studio apartment has a living space of 48 sqm including the balcony. 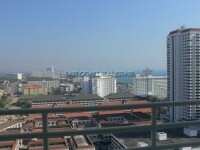 The unit if fully furnished, has a fitted kitchen, air conditioning and a beautiful view over the Jomtien Beach. The building provides 24 hour security guards, CCTV, communal swimming pool, cleaning service, Cable TV, parking spaces and many shops on the ground floor. Available for rent with a minimum of a 12 month contract at 20,000 Baht per month and 2 month deposit is required.